Brendan has combined his extensive experience in improvisation, creative thinking and the corporate world to create and lead engaging, entertaining, practical workshops, keynotes and seminars around collaborative innovation, creativity, team and leadership development. 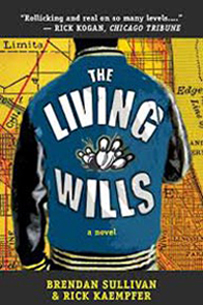 ”The Living Wills” by Brendan Sullivan and Rick Kaempfer (2011, Eckhartz Press) is a novel that has received great reviews from critics and readers alike. Available in trade paperback at Eckhartz Press and in e-book format from online retailers such as Amazon, Sony, Apple and Barnes & Nobel. Gina is on the run from a bad relationship, with her young daughter in tow. Reed and Lucy are trying to move on after the tragic loss of their only son. And Peter is a young man grappling with the reappearance of the father that left him years ago. Can one man, in spite of himself, bring healing and hope to these good people? Everything is connected. And not always in the ways you might expect in this story told with warmth, humor and surprises. One man’s brave decision has ripple effects that have lasted a lifetime. For years, clients and colleagues had suggested that Brendan Sullivan ‘write the book’ about collaborative creativity. They meant a non-fiction business book. Brendan decided to instead write a novel using the techniques that he uses in his programs. In essence, he decided to show them, not tell them. Brendan and his writing partner, Rick Kaempfer, deliberately used the techniques of collaborative creativity (improvisation, brainstorming, mind mapping, other ideation tools) to create the characters, plot lines and content of a powerful, contemporary American novel. The authors are available to speak about their collaborative writing process to your corporate group, writers’ conference, book club, etc. Contact Brendan for more details.